Gear expands to fill the space available. Your bag is overweight, oversized or both. Even though airlines seem to be tightening their restrictions by the day, carry-on bag sizes aren’t uniformly enforced. That means that some gear manufacturers choose to ignore carry-on bag size limits posted by airlines. They put a ‘carry-on’ label on a bag that’s too big, or they match the size of their gear to the most generous dimensions they can find, even when they know that could cause problems when flying other airlines. Since soft-sided bags bulge when packed full, the theory is, you can ‘just’ under pack to fit your carry-on into luggage sizers or to meet weight limits. Unfortunately, once you’re at the airport, it’s too late to under pack. Nothing is worse than being forced to donate all of your socks to Bertha before boarding. Trust us, your favorite pair of shoes will never recover… Go for a bag that fits! We live on the road and travel internationally all of the time, like #4realz. 45L bags often don’t meet the carry-on bag sizes set by airlines we fly regularly. We keep tabs on the top 200~ airlines worldwide over at CarryonBagSizes.com. With a bit of searching, we’ve even found that a lot of 35L bags exceed the dimensions of up to 25% of those airlines. It’s usually because their depth exceeds the 8-inch/20-centimeter threshold which is critical to fit under a seat. Yikes! Head over to Carry-onBagSizes.com and search for yourself. First off, you don’t want to get caught trying to slip onto a flight with an oversized bag. Airlines hate this and they charge anywhere from $35-100(!!!) to check a bag at the gate if your carry-on bag isn’t the right size. That only has to happen once or twice to equal the cost of a short flight, and a handful of times to match the price of a brand new bag. Over the lifetime of your gear, carrying an oversized bag can really break the bank. That’s before you account for added delays at the baggage carousel and that paranoid feeling every time you check in. Worse still, some airlines raise their fees to check luggage if you decide to do it on the day of your flight rather than when you book your ticket ahead. If your bag doesn’t meet the carry-on bag size restrictions or weight, the airline will do the deciding for you and you’ll be forced to check it. These ‘last-minute checked luggage fees’ can be up to 200% more expensive than if you arrange to check a bag online in advance. If you have a crazy story about overage fees–Ugh!–let us know on social (Facebook, Twitter, Instagram). In the long run, when you invest in well-thought-out gear, you can relax knowing that your fully-packed carry-on bag will slide into the luggage sizer. Phew! More importantly, it’ll fit comfortably under your seat or in the overhead bin on the actual plane. You’ll also be able to save a bundle by booking the the best ticket deals you can find without having to think twice about carry-on bag sizes. What that means is the freedom to fly on whichever airline you like. Plus, you’ll be a noble seatmate who hasn’t fudged the numbers to sneak a bit extra on board. If everyone’s bags met the airlines’ carry-on bag size standards, planes would board faster, and there’d be 1000% fewer devastating elbows thrown in the fight for overhead bin space. Recent footage from seat 23C on CA301. Sinister ‘bows thrown by Tony Jaa. Ultimately, we designed the Minaal Carry-on 2.0 to be the right size for domestic OR international travel and the right fit for you. We couldn’t believe it when we got started building gear, but there’s ZERO industry standardization for measuring capacity and a million variables that affect the result. Those variables include, padding, internal organization, pockets, materials, elasticity of fabrics, added structure, modular systems, and a lot more. Even the shape of internal and external pockets themselves can create corner gaps and odd spaces that gear can’t be stuffed into efficiently. If you multiply the stated linear dimensions of a given bag, you’ll come up with a rough estimate (Volume=Length*Width*Height). But if you actually fill the pockets of the same bag with as many marbles as you can and then measure their volume, the results could be drastically different. Marbles make a good standard tool for comparison because they don’t compress but your clothes definitely do. So it’s no surprise that if you filled your bag with actual gear and then measured that, you’d get yet another result. In other words, thinking about capacity measurement in liters is like comparing directions as-the-crow-flies to the actual driving distance of a winding country road. It makes for nice round volume numbers, but it doesn’t track with what you can really fit in a bag. That’s how one person’s 35L bag fits as much as another’s 50L. ‘Whoa!’ right? In other words, when it comes to zeroing in on the best carry-on bag size, volume in liters is pretty much meaningless. Instead of designing our bags to match an arbitrary number of liters, we spent an insane amount of time actually testing them against our real world, real travel, real packing standards. Because we’ve tested the gear relentlessly, the Minaal crew speaks for itself. Viva la Capacity Measurement Revolución! Oh and, as a fail safe, we’ve printed our dimensions in a sneaky spot right on your shoulder strap. Now, the next time you encounter an overzealous gate agent, you can prove that your bag is regulation size. Another equally important factor in avoiding the dreaded baggage fee is weight. Don’t forget that’s often limited too. Airlines sure won’t. You don’t have to be a pro at ‘ranger rolling’ your t-shirts to push the weight of your Carry-on 2.0 to the maximum allowable limit, especially if you’re taking a laptop and other tech gear along. If you can pack your bag to reach the max weight, you have all the space you need. The key is to make sure you’re carrying extra gear that could be useful rather than extra bag material that isn’t. When we designed the Carry-on 2.0 we sized it to be just right for round-the-world travel without any excess. 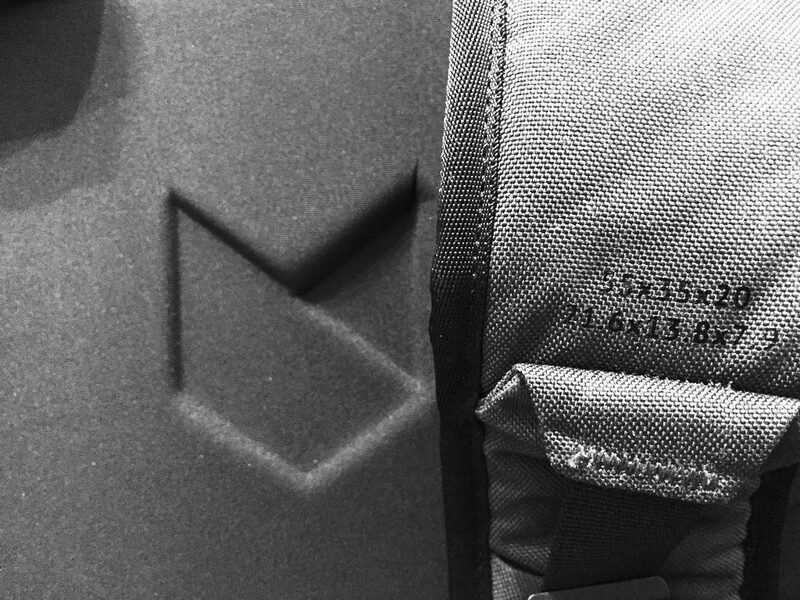 That decision and our obsession with using high-quality lightweight materials means we’ve handed roughly an extra two-plus pounds back to you when compared with similar bags. That’s two pounds of stuff that you actually want to pack on your trip instead of added bag material! But how much is two pounds, really? Well, the heaviest single item you’ll carry is probably your laptop. For reference, a new MacBook weighs 2.03lbs. Umpf! A couple of pounds really add up. We hit the pavement and talked to a zillion travelers. We packed and unpacked and tested relentlessly. We scoped out the competition in souks, bazaars and the darkest parts of the Amazon (well, amazon.com mostly). We even rounded up the data on almost 200 airlines for you at Carry-onBagSizes.com. Now that our gear is battle tested we’re pretty sure we’ve found the answer. The best size for a carry-on bag depends on you. More specifically, it depends how you travel.